Editor's Note: We're glad to announce that Cart2Cart now supports automated migration to Magento 2! Get on board, it's time to move on! Since the progress doesn’t stand still, every shopping cart should constantly improve to keep a high market position. It seems that Magento has learned this rule by heart. The entire e-Commerce community has been highly anticipating the release of Magento 2. Despite the fact, that only beta version is yet available, everyone keeps wondering - what are the platform’s new features. “Good things take time and great take a lot of time”. Thats why we have some great expectations for the platform that’s been in development for more than four years. 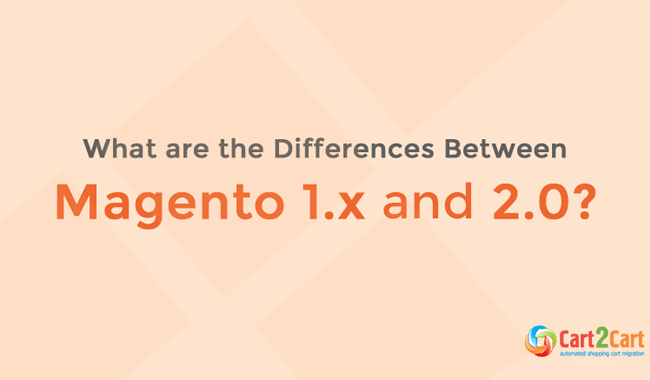 In this article, we’ll try to raise your awareness by describing the essential differences between Magento 1.x and 2.0. The usage of modern technologies. Magento 2.0 will be using the most recent and popular versions of PHP, particularly 5.4 and 5.5, HTML5, CSS 3.3 and the latest versions of JQuery. 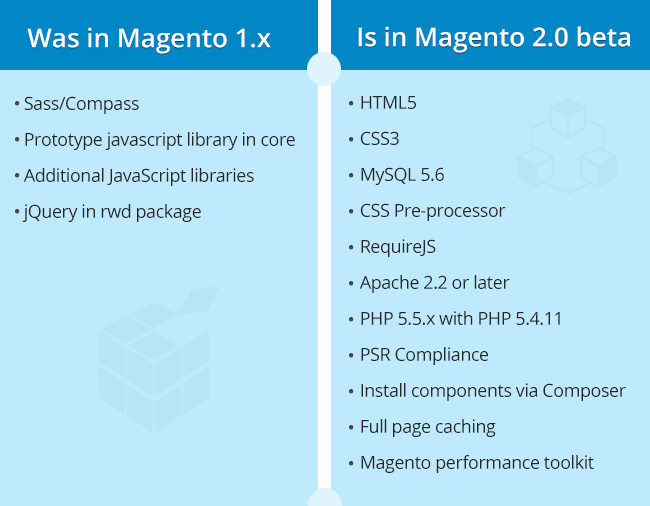 Overall differences between technologies included in Magento 1.x and 2.0 are presented in the table below. Simplified customization. If previous Magento versions required technical knowledge for layout manipulations, the new one will make this task clear even for newbies. The straightforward design management will be provided by the new Visual Design Editor. The feature, with the easy to use, “drag and drop” interface, will permit every merchant to modify blocks and containers with no substantial effort. We look forward to it. Component oriented module structure. Magento 2 will include a set of modules with a high coupling code to allow shop owners administer relationship between them much easier. With this update, merchants obtain a possibility to enable, disable or replace the components according to their needs, through a specially developed interface. Thus, if you want to get rid of Magento’s core complexity, apply your own implementations or even use the platform as CMS, the cart will provide with such opportunity. Modified directory structure. In order to make store management quicker, Magento will reduce the number of root directories from 9 to 5. For example, the new directory “pub” will contain all the data available for publicity. This system is more convenient than previous one, where numerous files were divided among “media”, “error”, “skin”, “js”. 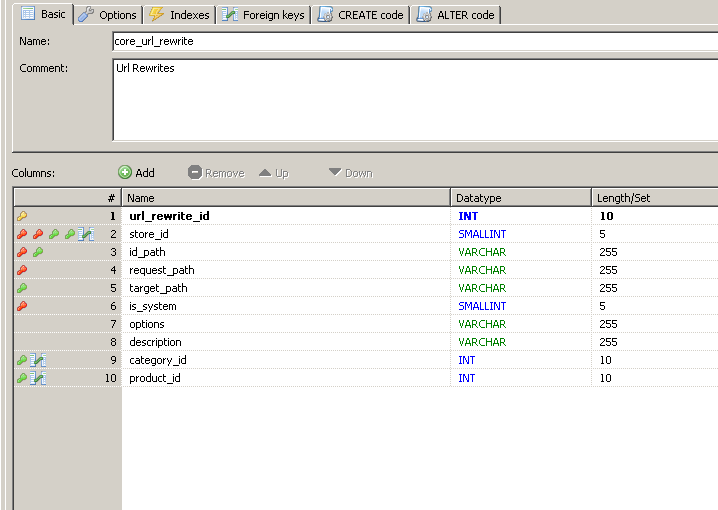 Also, shop owners will be able to place their Magento application files outside of webserver document root. 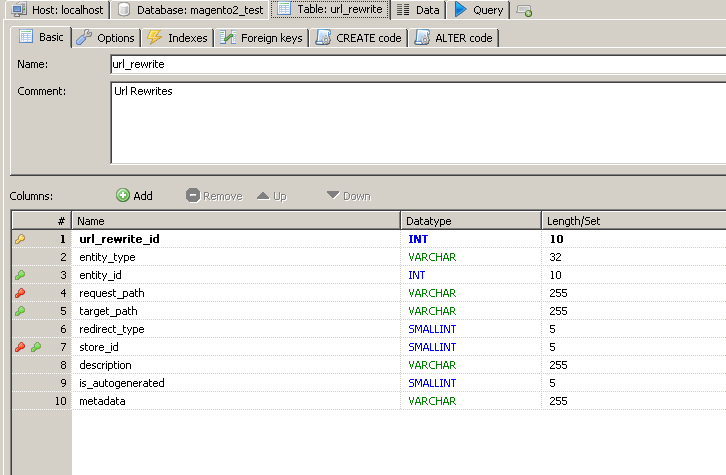 Also, we’ve learned that few of the tables are renamed, and some of them have more columns than before. All these changes are aimed at broadening the field of possibilities for both e-merchants and cart developers. But along with opportunity expansion, Magento is trying to improve usability and make itself understandable for the common user. So, let’s wish all the best to this advanced platform and hope that in the future it will gain the one quality it lacked - simplicity. In its turn, Cart2Cart promises to present every merchant with an opportunity to migrate or upgrade to Magento 2.0 as soon as the final version is released. As for now, you have an opportunity to upgrade your current Magento store to a newer version by undergoing automated Magento to Magento migration. 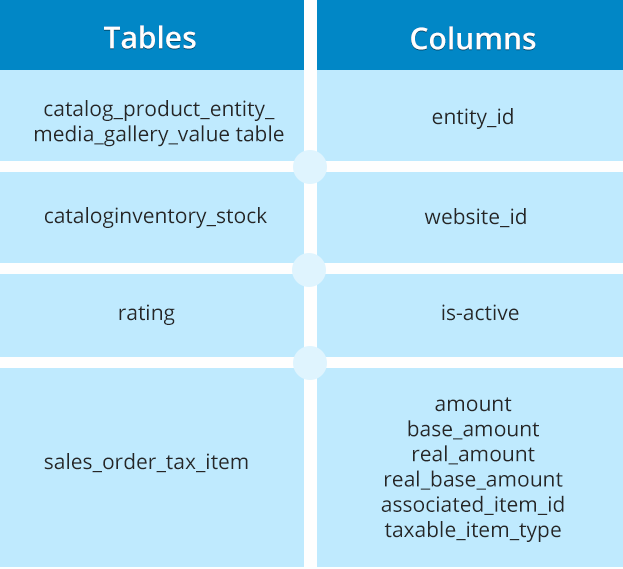 0 thoughts on "The Key Differences Between Magento 1.x and 2.0"